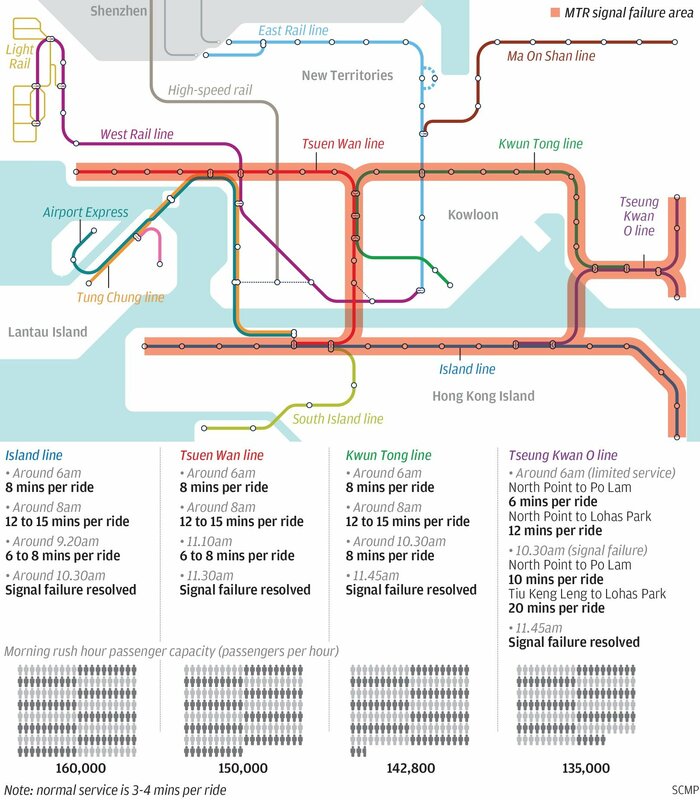 Hong Kong’s railway operator has been forced to seek overseas expertise to investigate its worst service breakdown ever due to a network-wide signalling failure so rare, there was nothing in its handbook to deal with an emergency of that magnitude. Facing universal criticism and anger after more than six hours of commuter chaos spanning Tuesday morning’s rush hour along four inner-city rail lines, the embattled MTR Corporation offered to cut fares by half for a day by way of an apology. “The corporation will provide fare concessions of about half fares for one day as soon as possible to thank passengers for their support and patience,” managing director Jacob Kam Chak-pui said. Describing the breakdown as “very unusual, rare and unprecedented”, Kam could neither pinpoint the cause nor rule out any possibility as he announced the setting up of a panel to investigate, assisted by a signalling system expert brought in from outside Hong Kong. The trouble began at around 5.30am on the Island, Kwun Tong and Tsuen Wan lines before expanding to the Tseung Kwan O line as well. The MTR Corp said centralised speed instructions could not be transmitted to trains along the four lines, forcing drivers to switch to manual mode and slow down services for the sake of safety. While the rail operator said trains were running at 12-15 minute intervals instead of the usual 2-3 minutes as a result, passengers had to wait for half an hour or more to get on as hundreds of thousands found themselves stranded on jam-packed platforms. Many complained of being stuck for hours. Other modes of public transport struggled to pick up the slack as commuters desperate to get to work or school formed snaking queues at bus stops and taxi ranks. The chaos and frustration continued until train services gradually resumed at 11.45am. The knock-on effect on road traffic was also severe – the drive from Argyle Street in Mong Kok to the Eastern Harbour Tunnel, for example, took more than 80 minutes instead of the usual 25 minutes at around 11am. MTR Corp operations director Adi Lau Tin-shing said staff were investigating whether the massive disruption was linked to a network-wide signalling system upgrade – work on that is carried out every night during the few hours when trains stop running. Upgrading work and testing was conducted on the Tsuen Wan line on Monday night. Kam said the investigation would take more than two months and it was still too early to talk about whether the signalling system upgrade should be suspended. The rail operator had warned in 2016 of possible delays hitting the first trains in the mornings over a period spanning a decade due to the upgrading work along seven lines – the aim being to expand capacity by 10 per cent from 2018 to 2026. As commuters struggled to get to work in the morning, Chief Executive Carrie Lam Cheng Yuet-ngor urged employers not to penalise latecomers as they had no control over MTR delays. “If the railway malfunction has made workers late for work … I call on employers to be considerate,” she said. Lam said she would urge the MTR Corp to improve preventive measures against breakdowns but conceded she did not know what had caused Tuesday’s crisis. “I don’t know what today’s issue is – is it mechanical? Or manpower?” she said.